It's an ordinary day at Landrock Pacific Bank - ordinary for everyone but I.T. expert Jack Stanfield. His wife and children are held hostage at home. Their kidnappers have one demand: Jack must heist $100 million from the ultra-secure system he designed. And they'll be watching every move he makes. 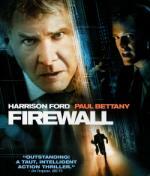 Showing the Everyman vulnerability, strength and resourcefulness that make him one of film's most appealing heroes, Harrison Ford portrays Stanfield in this cyber-edged race against time. Paul Bettany (The Da Vinci Code) co-stars as an ice-blooded crime mastermind. And Virginia Madsen (Sideways) plays Stanfield's wife, who disregards her own terror to protect her children. The criminals' plan is airtight. They figure they can't lose. But they overlook one thing: the desperation of a man with everything to lose. This action-packed thriller is in full throttle practically from the opening scene! Although the plot is far from new, the added new twist of robbing the bank using bits and bytes instead of with guns freshens up the old “hold the bankers family for ransom” trick. Harrison Ford is excellent as always (they even use Jack as his character name, bringing to mind his roles as Jack Ryan), and Paul Bettany is quite good as the polite but totally ruthless bad guy. Unlike many movies where technology is used (or abused), this film stuck with what is actually feasible and doable today. There was no far-fetched plot device to accomplish the end goal. This one will keep you on the edge of your seat from start to finish!